The Chongoni Rock Art Area consists of 127 sites that feature the richest concentration of rock art in Central Africa. They reflect both the traditions of rock art of the hunter-gathers and of agriculturalists from the Late Stone Age til the present day. The paintings are connected to living traditions: funeral rites, girls' initiation and rain making. However, Malawi's location, surrounded on three sites by Mozambique places it off the usual safari, African tourist track. It's not difficult to get to, just off the beaten path, so you have to make Malawi a destination and want to visit. This world heritage site is in the same category--not hard to get to but it does take some specific effort (and patience). I visited two of the three Chongoni rock art sites that are open to the public (i.e., accessible without unsafe hiking into the bush, for several hours with a guide, if you can find one able to take on the task) in August 2014, from Dedza, a busy transport center in the (thankfully) cool highlands. Dedza is easy to reach by bus or car from either of the big cities in Malawi, Lilongwe or Blantyre. Once in Dedza, to get to the rock art sites, unless you have your own transport you must arrange a car and driver/guide. Any of the staff at the lodges should be able to do this. My cost for a full day was about $65. There is a dirt road to the sites, full of pot holes, ruts and gullies used mostly by heavy sawmill trucks, which I imagine doesn't help the situation and, according to my driver, the road is not well maintained, so every rainy season the situation gets worse. So although the distance between the sites is not much, average speed is going to be about 20km an hour or less with much bouncing around and, in the dry season, dust. The first site I visited, Chentcherere, is a brief and not to difficult (unmarked) climb up a hill and through some brush with beautiful views of the countryside and what's left of the forest. As for the rock art--unless you're an expert on petroglyphs and have a discerning eye it was hard to differentiate the white paintings the driver (admittedly not a guide but familiar with the site)pointed out from lichen, geological fault lines and other natural coloring on the rocks. There are no explanatory signs or directions to the paintings so I took the driver's word for it that what I was looking at was a giraffe or a lion (perhaps, finding only one of the four or so rock paintings clearly to be the depiction of a person my driver said it was. Several of paintings in the rock overhangs are also marred by mindless "I was here" graffiti. The climbing and scrambling over rocks to get to the five or six best paintings in this section of the site is not demanding but in the heat of the day it can be taxing on some, so bring water. On the plus side, their location in shady rock shelters or over hangings is an added pleasure, as are some of the views over the village and the countryside. 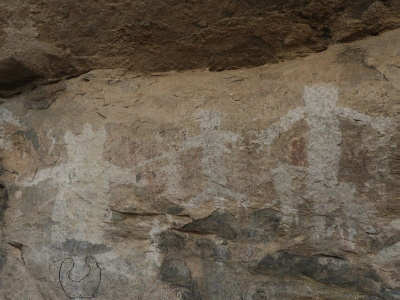 Unfortunately, Mphunzi, although better maintained than Chentcherere, also has some paintings that are defaced or damaged to the point of disappearance (which the guide acknowledged) and there did not appear to be any attempt at preservation or protection, other than that which nature provides. The red paint drawings, despite being older, are much better preserved than the nearby newer white paint drawings. Overall, if you are a) in Malawi and b) a world heritage fan, then check out the Mphunzi site with a knowledgeable guide, a must if you want to even find the paintings, scattered and hidden as they are over the hillside, and also to gain some insight into what they signify. There is supposedly more information about the sites at the Dedza Forestry camp, (which also has a restaurant and lodging) about 20 minutes or so from the Chentcherere site on the way to the Mphunzi site but I did not stop there. Make it an early start to avoid the worst of the heat and finish with lunch at the Pottery Lodge. Role of Women: "Much of the rock art seems to have been carried out by women." 11 Community Members have visited.